I’m sitting at the Baden-Baden/Karlsruhe airport, waiting for my flight to Rome in an hour and a half. I’m never this early for a flight so I can do this until the last 14% of my battery dies. This airport is really weird and out of the way, like most RyanAir airports. On the shuttle I took from the Karlsruhe Hauptbanhof I sat next to someone with the worst body odor I've ever smelt in my life. Thursday marked two-months for me here in Europe and it seems to only get better with every day. In my previous post, I said Prague was the most beautiful city that I’ve been to so far. And it was, until I went to Paris. 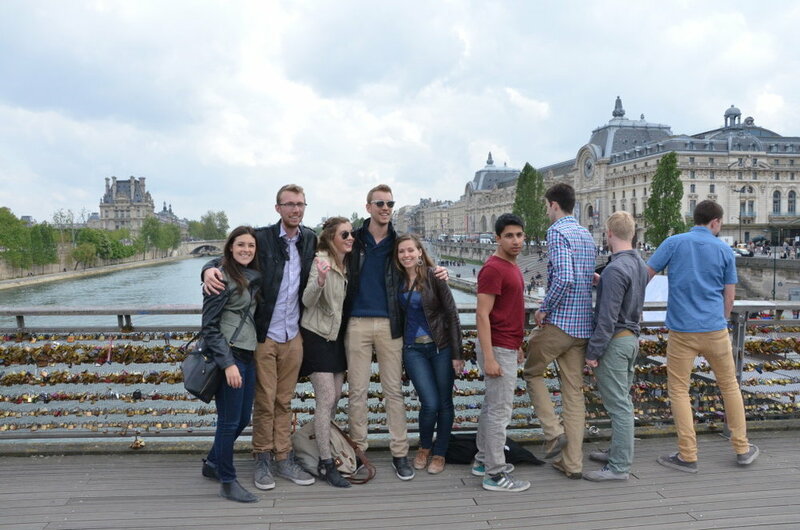 8 others and myself drove 6 hours to Paris 2 weeks ago for the long Easter weekend. I’ve wanted to go to Paris since I started watching Madeline in my kinder years, and as cliché as it sounds I think it really was all that I dreamt of and more. Speaking of, went on a really great 4-hour bike tour with a boat tour on the Seine included, plus 6 bottles of red wine that our Irish tour guide brought along. We also did a bike tour in Prague and can conclude that it’s probably the best way to see the most of a city in a few hours. Food: So many baguettes with Brie and Camembert, the best almond croissant of my life, and best macarons. ESCARGOT! which was really amazing, probably because of the pesto-butter sauce it was drenched in but still highly recommend !! The city is absolutely stunning and awesome because students can see a lot of the city for free with a student ID. My new goal in life is to live there for at least half a year at some point. Maybe when I graduate if I somehow win the lottery. Parisians seemed to understand my French, which made me feel like these past 8 years of French class have been worth it. We got back from Paris on the Monday after Easter weekend, which was also the weekend that Frühlingsfest started. It’s essentially Oktoberfest in the spring, in Stuttgart. Some say it’s better because it’s not as crowded, you can get a table in the tent, and of course it’s proximity to us is great. We went the first Tuesday night aka student night, where students can pay 9 euro for 2 liters of beer. Needless to say, our memories of getting home that night are pretty sparse but it was so much fun and definitely worth the pain we endured the next day. I also managed to finish the website that I started at the end of January (see here! www.lifestylespacedesign.com). That consumed most of last weekend, but after that was finally done, a friend and I went to the mineral baths in Stuttgart (located across the river from Frühlingsfest) and hung out in warm mineral pools for 2 hours. I don’t think I’ve ever done anything like that before that relaxed me as much as that did. All the stress of the website was gone and we got the most delicious gyro ever on the way back for 3 euro. WHAT A STEAL! It tasted more like a döner than a gyro but it was so bomb. If you ever happen to be at the Bad-Canstatt S-Bahn station in Germany, pls stop by this Greek place. Aaaaand now I’m sitting in a really nice apartment in Rome (after my laptop died at the airport) courtesy of AirBnb. I got here yesterday afternoon and explored a lot of the city today on a moped! I threw a coin in the Trevi Fountain and forgot the purpose is to make a wish but that’s okay cause I got a cool pic right? I AM HILARY DUFF! I’m here until Wednesday and then off to Barcelona! The weather has been meh so far but should be nicer for the rest of it. The pizza I had last night and antipasti appetizer was absolutely heavenly and I can’t wait to gain 10 more pounds on this trip. It’s called EATaly for a reason, right?